Not surprisingly, the 219 beat the 450SL in our-first all-Mercedes-Benz Choose Your Eternity Poll. It's hard for a 70s SL to compete with a big curvaceous Ponton on either coolness or agony. And, really, parts are just too easy to find for the Pontons, since they last about a million miles and all. No, for true Mercedes-Benz Hell, you need to go back, back, way back- back to the era when most examples perished under a rain of RAF and USAAF bombs and Red Army artillery shells. And, just to make things interesting, we'll pit the Benz against an American luxury car from the same year. PCH, Beelzebub&apos;s Benz Edition: &apos;58 219 or &apos;73 450SL? 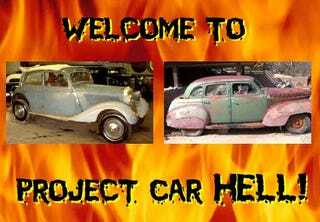 There's no way a 1938 Cadillac, Lincoln, or Packard is going to be as hellish as their Mercedes-Benz counterpart, because parts aren't impossible enough to locate. That's why we need to go with a Graham-Paige instead! With a supercharged six-banger under its long hood, a '38 Graham-Paige is just the car to make the Benz look low-end... but they're not cheap. Still, we think 42 grand might be a bit steep for this '38 Graham-Paige Touring Special Sedan, especially given its execrably bad somewhat rough condition. From the description, it seems that 1951 was the last year this car moved under its own power, and 20 years in South Dakota followed by 37 years in Texas haven't been kind to its finish. But don't worry, because "just about all pieces are there," according to the seller. If that big Buy It Now price isn't met- and we're pretty sure it won't be- you can swoop in and pick it up for a more reasonable price after the auction closes.